Home | Newsletter 132: Justice for Workers Has No Boundaries! Newsletter 132: Justice for Workers Has No Boundaries! Justice for Workers Has No Boundaries! 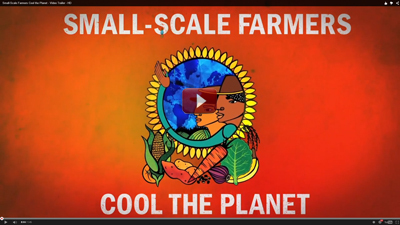 Fair World Project “Small-Scale Farmers Cool the Planet” Video Launch! Watch a preview of the video. 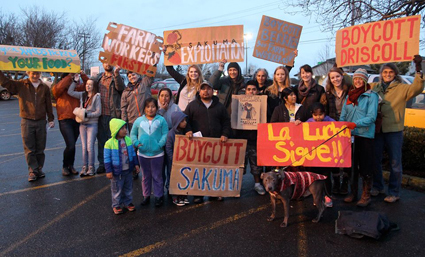 Thank you to all of you who showed support to farmworkers at Sakuma Brothers Farm in Washington and asked Driscoll’s, Sakuma’s biggest buyer, to use their leverage to help farmworkers. Earlier this week we mailed the letter you all signed to Driscoll’s asking them to suspend purchases of Sakuma Brothers berries until a fair and binding contract with farmworkers is in place. If you missed the story, you can read more about it on our blog. This is farmworker awareness week and a good time to show support of farmworkers. Whether or not you signed the letter to Driscoll, you can still take action this week by writing a letter to the editor of your local newspaper to help raise awareness of this issue. We’ve created a template to make it easy, but you can add your own voice too. The current federal minimum wage is $7.25. There has been a lot of well-warranted excitement recently about cities and states raising their local minimum wages. But the reality is that many working families do not live in Seattle ($15/hour by 2018), or Richmond CA ($13/hour by 2018) or Montgomery County, MD ($11.50 by 2017) and are still subject to the $7.25/hour federal minimum wage. A single working parent raising a child on minimum wage is making a poverty wage. Though most people support an increased minimum wage, the last bill stalled in Congress. This year we may get another chance to raise the minimum wage. Farmworkers in Mexico block harvest in strike over low wages on farms exporting produce to US. El Salvador farmers successfully defy Monsanto. FWP sends Nestle a letter urging them to work with real farmers to source vanilla, not replace artificial vanillin flavor with “natural” flavoring or synbio. Dunkin’ Donuts to remove nano particles from donuts. Have we reached a tipping point on minimum wage where we finally realize raising the wage helps the economy?